Aurence is a folk artist and Biegun is photographer. Those two things we do well. But we are also imaginary and creative people who enjoy experimentation. Some things we abandon quickly and some things we find that both we, and other people, enjoy. Making our handmade papers together has become almost zen-like to us. Not only are we recycling, we are making beautiful cards and papers that other people can share with loved-ones. We hope that you enjoy our mixed bag of creations. Stands and other accessories not included in sale. We love to recycle! Aurence uses the Fancy Feast lids from our cat's food to paint whimsical cats. Some cats come with stands made from the actual cans. Biegun sometimes adds ornamental items using scrap materials. If there is no price showing on single cats, they are $22. 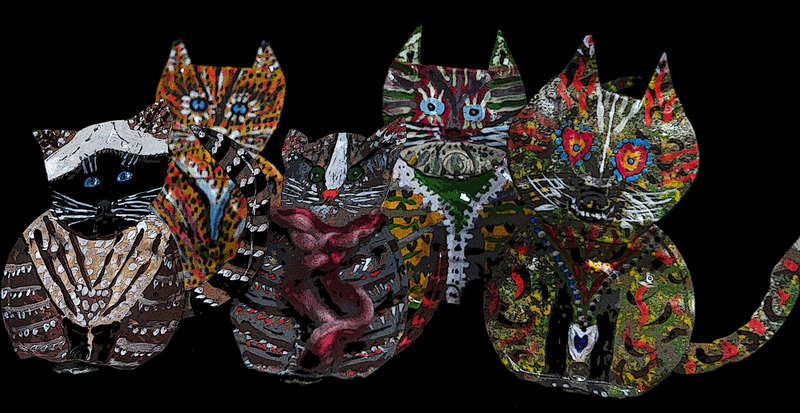 Cats decorated by Biegun with scarves or jewelry are $22-27, and will be priced as such. Cats with can stands are $30 and will also be priced. If you would like a special cat name, just let Aurence know. Where's White Dog? On the back. Caveat: Some cats have very sharp edges. This is rough cut tin. Not suitable for children. Just find a nice cozy shelf and leave your art cat on his own. How cat-like!